Your child tells you they have a big test in three days. If you are concerned that your child won’t focus enough to study well and make a good grade, use our tips listed below to give him the best chance to do well! Even if you or your child aren’t a type A personality that loves a good to do list, getting organized is very good use of your time. You can avoid reviewing that last chapter at 10 p.m. if you know what has to be covered for that big test. Write out all the items needing to be reviewed or learned and the time period allowed. (What?!) Prioritize your study list with the most difficult items first. Doing the most difficult task (eating the frog) first gives the harder activities your most energy and effort before you start to get tired. Many will want to do easy tasks first to get them out of the way, but research shows the rest of the study session will be smooth sailing with the frog gone. We start with corrections at Gideon as this is the least favorite task for anyone. Who wants to look over where they have gone wrong?! Everyone would much rather start fresh, but this is one of the most important things we do, so we found doing it before the child gets tired is best. Is the frog really hard to swallow? Don’t let your child give up. Remember the growth mindset. Our brains are not fixed at a certain intelligence. They continue to grow through practice and training. Can’t sit still? Have your child run around and play for 15 minutes. Light exercise before difficult tasks gets the blood to the brain and helps them think better afterwards. However, don’t let this extend into hours of procrastination and then exhaustion. Same time, same place. Routine is very good for children. They know what is expected of them and what to expect from caregivers. The closer you stick to the routine, the less they will ask for deviation from it. If spelling tests are every Friday, set up a schedule for write out the words every Thursday afternoon in a certain place. We encourage Gideon students to come the same time and day each week. Develop a routine that works for your family and do your best to stick to it. 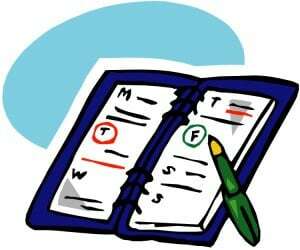 Decide which things in the schedule are prioritized and try to not move them around. Find a clean, clutter-free area for her to study where the TV is not seen or heard, the dogs cannot get in, and the siblings are unable to pester. Fewer items on the table and reduced noise help keep the student focused on the task at hand. We are all looking for reasons to stop working on something difficult so remove each one you can. Many people believe watching or listening to a TV is fine as they believe they are great multi-taskers. However, studies show that multitasking is really just slowing you way down. Make TV the reward AFTER the studying. However, non-lyrical music such as classical can help concentration so feel free to play some background music. This is useful also to drown out other noises or conversations. Write it out to memorize it. The act of writing by hand greatly aids memorization. While typing is faster and easier for editing, hand writing helps you remember what you wrote better. Remember how we memorize spelling words? Flash cards and other mnemonic devices such as: PEMDAS – Please Excuse My Dear Aunt Sally (for order of operations – parentheses, exponents, multiplication, division, addition, and subtraction) can be very useful as well. Many adults remember those phrases years later. Try to avoid cramming so breaks won’t seem wasteful. If possible, divide a large study session into several days or a weekend. Doing it all at once can lead to burnout. The Gideon curriculum and structure divides difficult concepts into several booklets which are then divided into small chunks for each day. 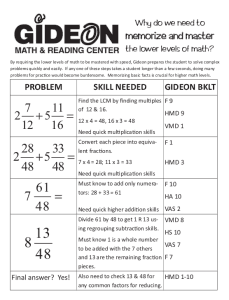 Why memorize and master the lower levels of math? It seems like a better use of time would be to stay up late or all night to study, but a full night’s rest is necessary for our brains to retain all that we just learned. Sleep does amazing things for us physically and cognitively. At a certain point, just call it a night! Need more tips? Look through this checklist to get other ideas. Want focus and concentration skills built into your child’s life? Contact us today for a free diagnostic testing!